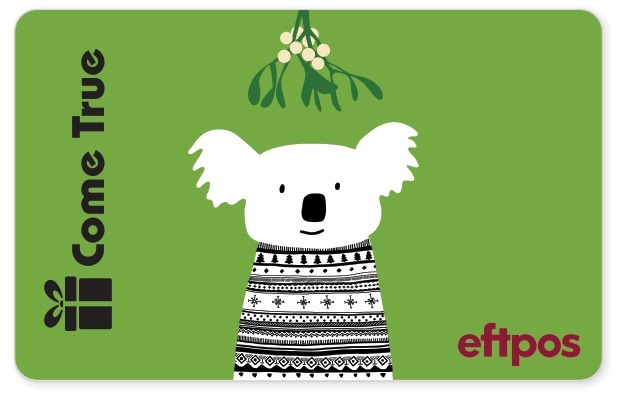 This has got to be our cutest eftpos gift card design… And our most popular. A koala is pictured in their best jumper, waiting for their sweetheart beneath the mistletoe. Really, there’s nothing cuter. For those who tire of the northern hemisphere’s portrayal of a snowy Christmas, this card is perfect. Even though it’s a little unrealistic. I mean, who wears a jumper in December? That aside, these cards can be a great big help at Christmas time when your to-do list is as long as your arm. Staff gifts? Sorted. Campaign incentives? Done. We want to make the end of 2018 a breeze for you. And because we can manage all the admin of that comes with an eftpos card order. That involves everything from design to dispatch, delivery, and any enquiries that come out of card usage. We can even brand our customer service as your own for a full-customised campaign. Just let us know what you need and we’ll find a solution that delivers. The team at Rewards Come True has been running behaviour marketing programs for over 20 years. We’re Australia’s original provider of customised eftpos and Visa gift cards, offering the most flexible design options on the market. © iGoDirect Group 1998 – 2019, all rights reserved.